In this season of giving, it's easy for my boys to shift their focus to a season of getting. It's easy for all of us, really. We are bombarded with commercials and images of lovely items that we all want under our Christmas tree. As an adult, I've seen the joy that comes with sharing with others during the holidays. That joy is something I want to give to my boys. So, I was super excited when Teachmama and a few other bloggers announced Blog4cause. The idea behind it is that little hands can make a big difference if we as parents shift their thinking from getting to giving. #Blog4cause allows participants to pick their own causes and share them. I love this idea because it allows me to choose causes that are important to me and causes that I think my boys will relate to. I also love that they have a linky party so I can check out other opportunities for service. For our first project this year, we decided join our church in the Operation Christmas Child through Samaritan's purse. This organization collects shoe boxes that donors fill with treats, toys, and essential supplies for children living in poverty around the world. We chose to fill a box for a 2-4 year old boy. Tyson does a lot of shopping with me while Logan is at school, so Logan got the job of designated packer. First he looked through all of the items and he wanted to keep them all for himself. As we packed, I explained that there were some kids in the world who didn't have as much as he did. Likely this box would be the only Christmas present the child would get. It literally blew his mind as he thought about all the presents he would get from the many, many people who love him. By the end, he was all about helping this little boy. He even reminded me that I had packed a toothbrush and forgotten toothpaste. Duh, mom! Not only did Logan learn a little about giving, but I added a little literacy learning to this activity. 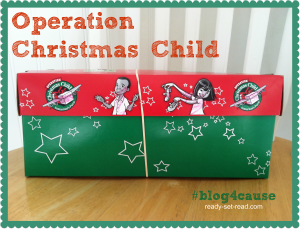 Operation Christmas Child encourages givers to add a personal note to their box. 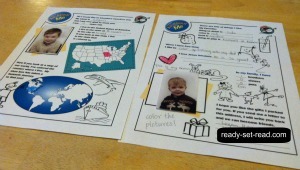 They even have a printable "All about Me" worksheet for kids. Logan and I filled it out together, sharing the pen, modeling some good writing skills. Then he did a little bit of coloring on the sheet and on the box. I really wanted to pick at least one International Project to participate in this year. My sister's family is in the process of adopting a little girl from China-- they are flying into Shanghai tonight and meeting her in just days-- and part of our family's heart is overseas right now. It excites me that Operation Christmas Child will take this little gift of love somewhere across the world. 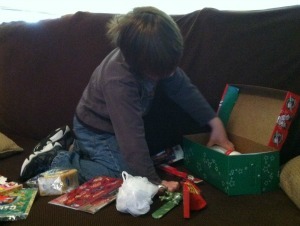 I also love participating in Operation Christmas Child because it allows a kid to help another kid. We've been praying for the little boy that receives our gift. We hope that he will feel loved! Check out more #blog4cause ideas on the linky party here. How do you help your child realize the joy of giving during the holiday season?